Research Interests - Chai, Rob Y.H. Challenges in structural and earthquake engineering research require a fundamental understanding of the complex behaviors of structures under various environmental conditions. Such understanding in turn requires quantitative evaluations of structural response under normal operations of the structure and extreme overload conditions. 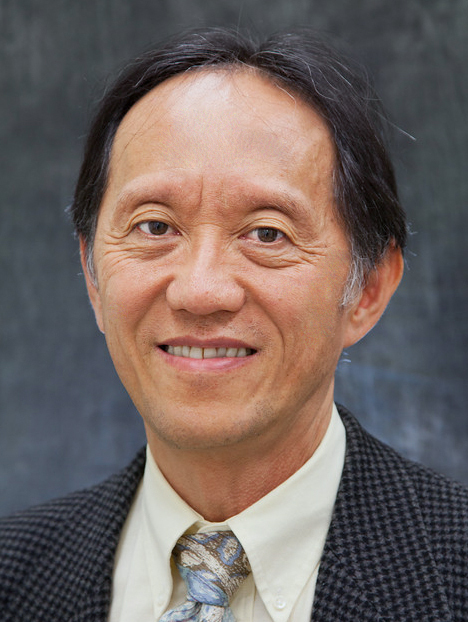 Professor Chai’s research is guided by both numerical and experimental simulations. In the area of earthquake engineering, he addresses design-related issues and has conducted a number of studies on the cumulative damage assessment of structures under high-intensity seismic loading. To address the issue of duration-related structural damage, he extracted seismic input energy from the Fourier amplitude spectrum of the ground motion and used it as a design parameter for characterizing the damage potential of the ground motion. He has also conducted experiments to correlate the plastic strain energy capacity of structures to the peak response displacement imposed on the structure. The ultimate goal of his research is to combine the seismic energy demand and plastic strain energy capacity studies into a framework where duration-dependent seismic design spectra can be established. On the experimental front, Professor Chai has been involved in testing of large-scale structural components. He seeks to provide experimental verification of design details that are critically important to ensure a ductile response of structures. Completed projects include (i) flexural strength and ductility assessment of reinforced concrete piles under the interaction of soils, (ii) displacement capacities of closure slabs for staged bridge construction, (iii) cracking and durability of bridge approach slabs, (iv) lateral stability of reinforced concrete wall-columns under large-amplitude reversed cyclic axial tension and compression, (v) ductility capacity of slitted reinforced concrete masonry wall-piers under reversed cyclic loading, (vi) damage characteristics of lightweight concrete precast wall panels under reversed cyclic loading, and (vii) in-plane reversed cyclic response of level and stepped cripple walls. He is also involved in field monitoring of a long-span lightweight aggregate concrete bridge for short and long-term service performance. 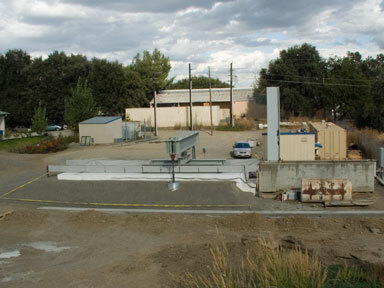 Shortening Closure Pour Waiting Time for Bridge Construction – Funded by the California Department of Transportation. Investigators – Y. H. Chai & Garry H. J. Hung (UC Davis), Peter Lee, John Drury & Darin Kishiyama (Caltrans). 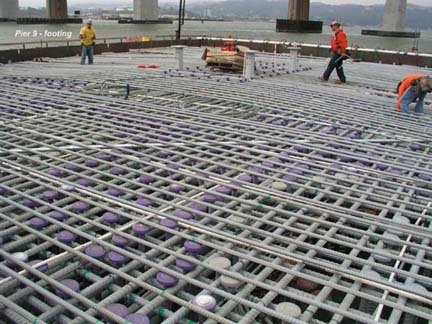 Current bridge construction practice in California specifies two alternatives for the waiting time before the closure pour can be cast. 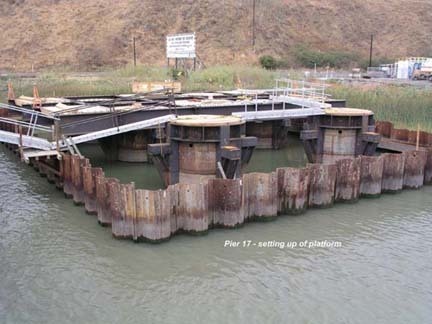 The waiting time is intended to minimize the stress build-up in the closure slab arising from long term differential displacement between new and existing bridges, or between stage I and stage II bridges. The current waiting time is long and often leads to unnecessary delay before opening the bridge to traffic. 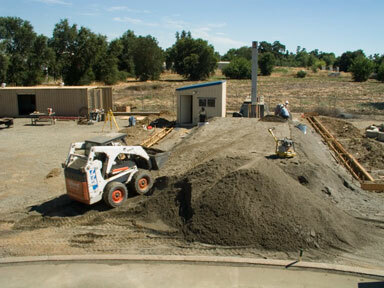 A long waiting period invariably leads to an increased construction cost and undue safety hazards during construction. Temporary K-rails typically placed at the edge of the bridge before closure impedes thetraffic flow and the longer these K-rails remains in-place, the higher the potential for traffic accidents. 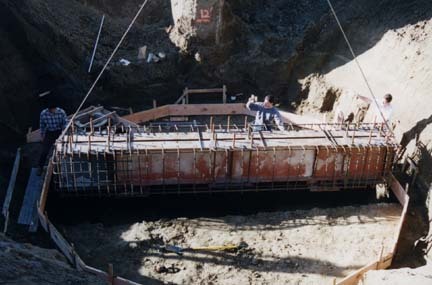 Careful considerations of time-dependent bridge deformation and its implication on the waiting period are therefore important for bridge widening or staged construction. 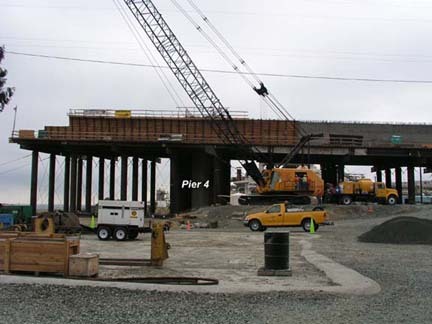 Waiting period currently specified by Caltrans does not take into account the displacement capacity of the closure slab and the time-dependent differential displacement that would be imposed on the closure slab. 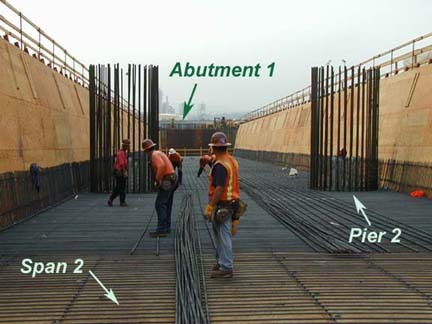 In this project, evaluation of the closure pour waiting time is undertaken in three steps. In step 1, a predictive model based on the creep compliance function is used to predict the time-dependent differential displacement across the closure slab for both staged construction and widening. The predictive model is shown to correlate well with field measured deflections for two box-girder bridges up to 12 months. 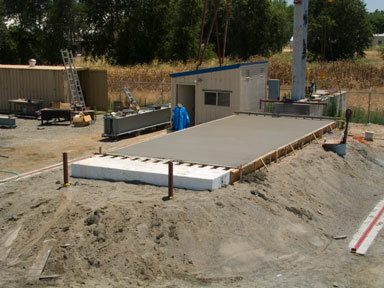 In step 2, four full-size closure slabs were tested to determine the displacement capacities of typical California closure slabs. 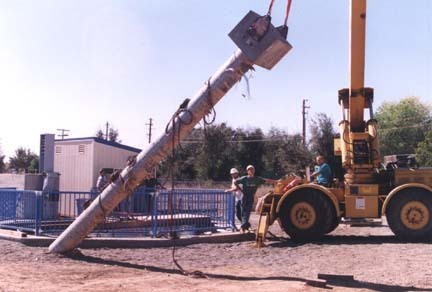 In step 3, a procedure based on the predictive model and laboratory determined displacement capacity is proposed to determine the waiting time for closure pour. Optimum waiting time for closure pour requires a prediction of time-dependent deformation, which is invariably complex and involves the age of concrete at loading, ambient and curing conditions, type of cement, water-to-cement ratio, size and shape of the member, load duration etc. 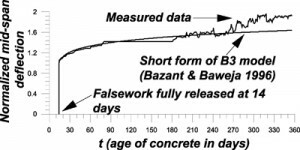 Initial time-dependent deflection upon falsework release can, however, be predicted using a creep-compliance function assuming correspondence between structural level deformation and material level deformation. 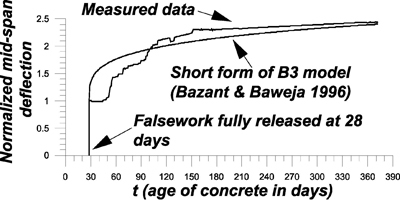 Among various models available in the literature, the short form of the “B3” model proposed by Bazant and Baweja (1996) for concrete creep compliance is used to predict the differential displacement between new and existing bridges. The short form of the B3 model has been noted for its accuracy and simplicity for general use in design or field offices. A comparison between the measured deflection and that predicted by the B3 model is shown in the figures below. 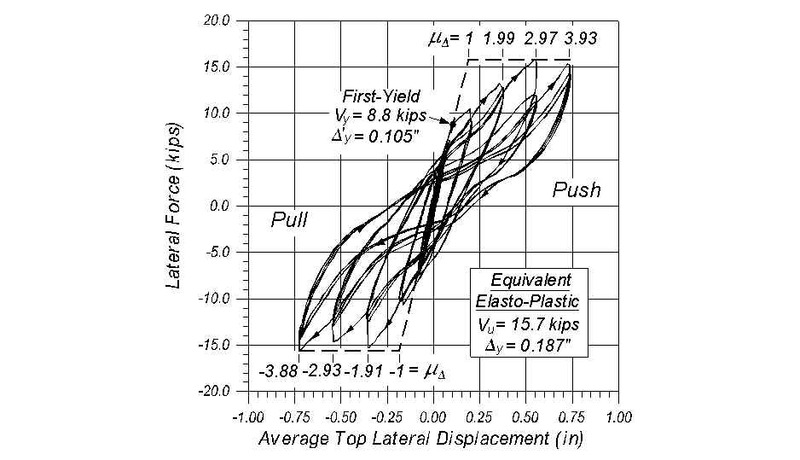 Test results of four full-size closure slab specimens indicate that closure slabs in California exhibit rather brittle shear failure (see figures below). Special attention needs to be paid to stiff closure slabs, which are characterized by narrow width and large thickness, as brittle failures can be expected at small differential displacement. 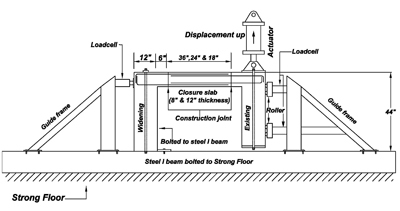 A methodology for determining the waiting period for closure can be formulated by requiring the displacement demand on the closure slab to be less than the displacement capacity of the slab. 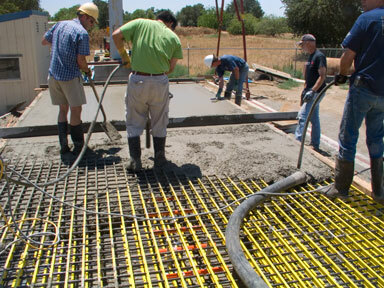 A shorter closure pour waiting time is generally permitted in a wide closure slab than a narrow closure slab. 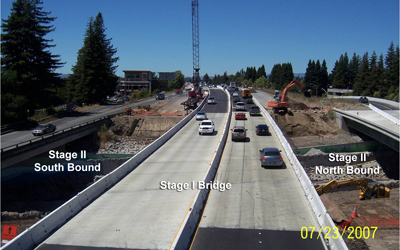 Closure for staged construction should also have a shorter waiting time compared to bridge widening, since the differential displacement between stage 1 and stage 2 bridges in staged construction is expected to be smaller than that of bridges during widening. Numerical examples indicate that a 60 days waiting period is unnecessary in many cases, and is especially true for bridges with small instantaneous displacements and in staged constructed bridges where differential displacement across the closure slab is small. References – Z. P. Bazant and S. Baweja “Short Form of Creep and Shrinkage Prediction Model B3 for Structures of Medium Sensitivity”, Materials and Structures, 29:587–593, 1996. 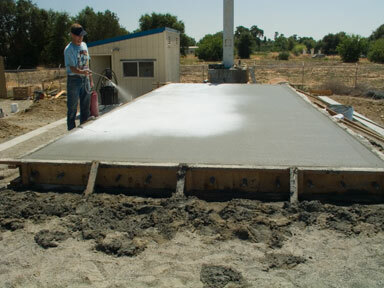 Replacement Alternatives for Deteriorated Approach Slabs – Funded by the California Department of Transportation. Investigators – Y. H. Chai, Stanley Y. T. Chen and Garry H. J. Hung (UC Davis), Saad El-Azazy & Jim Gutierrez (Caltrans), Hans Strandgaard (CH2M Hill), and Chris Dumlao (FRP Specialist, Pleasanton, CA). Consolidation of underlying natural foundation soil, compressive deformation of fill materials and erosion of approach embankment often result in significant differential settlement between the bridge structure and approach pavement. The differential settlement, commonly called “the bump and the end of the bridge”, was estimated to affect about 150,000 bridges in the US. The settlement leads to uneven road surface and deteriorates the ride comfort of the traveling public. 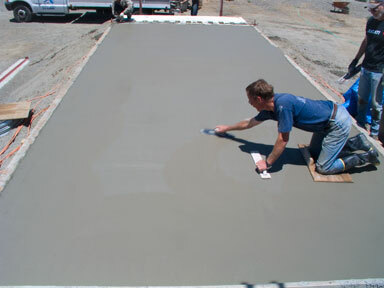 Approach slabs are commonly used to mitigate the uneven surface by enabling smoother transition between the roadway and bridge deck. 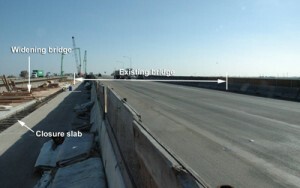 The approach slab also serves to reduce the dynamic load imposed by heavy trucks on the bridge. 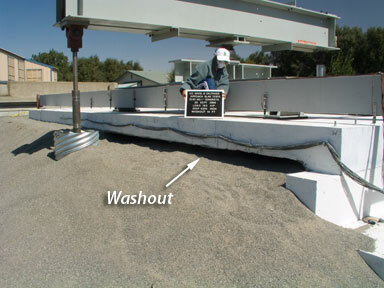 Current construction of approach slabs relies on cast-in-place reinforced concrete slabs with dowel anchorage into the abutment or threaded rod and nut system into the bridge deck. 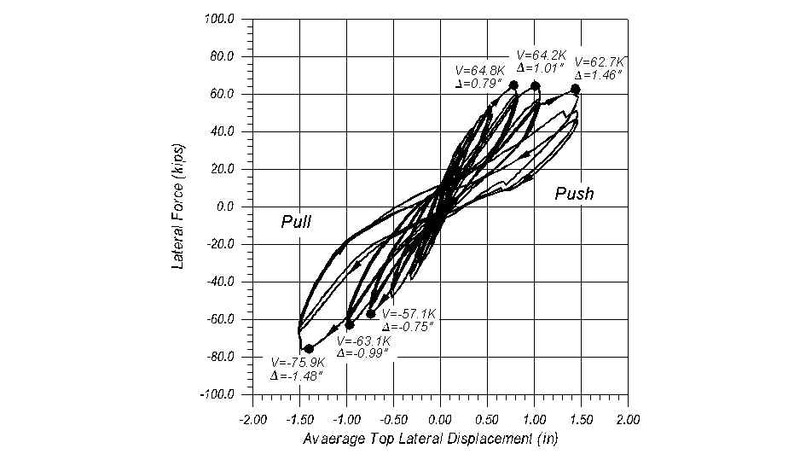 Although there is no uniform design of the approach slab across the US, unsatisfactory performance of approach slabs has nonetheless been reported in many states. 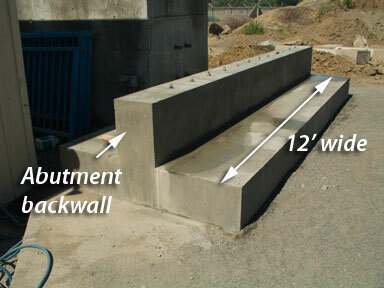 Factors contributing to unsatisfactory performance of approach slabs include (i) time-dependent consolidation of the natural soil under the embankment and/or fill material due to inadequate compaction, (ii) poor drainage behind the bridge abutment resulting in erosion of the fill material and void formation under the approach slab, (iii) longitudinal and vertical translation as well as rotation of the abutment causing localized damage at the connection of the approach slab. 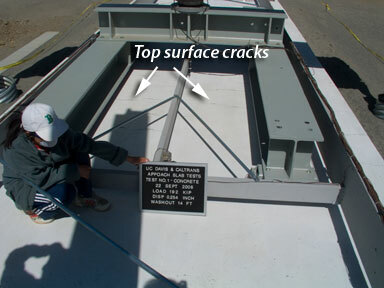 Distress in the approach slab often manifests itself in the form of transverse and/or longitudinal cracks, which tend to decrease the service life of the approach slab and increase the maintenance/repair costs of the structure. 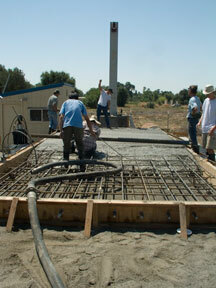 In California alone, nearly $8 million was expended on replacement or retrofit of approach slabs in 2004. 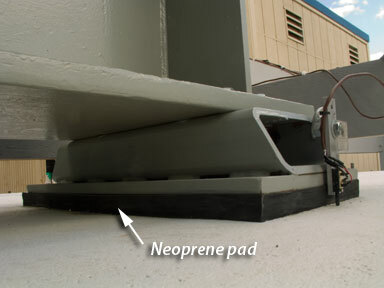 Although a damaged approach slab is typically replaced by an in-situ reinforced concrete slab of similar details, other replacement options exist including precast concrete slabs or prefabricated fiber reinforced polymer (FRP) decks. 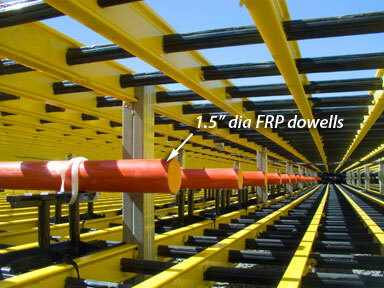 In this project, prefabricated FRP decks as well as FRP gridforms and rebars are investigated as replacement options. Full-size (12 ft wide by 30 ft long and 12 inches thick) approach slabs are tested under simulated wheel loads up to 4 times HS20 truck loads. 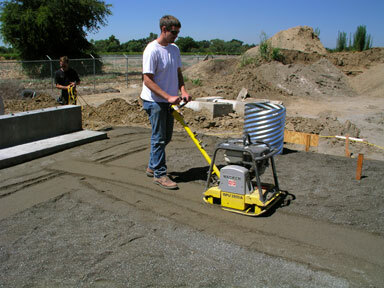 Performance of the approach slabs are examined under simulated washout conditions. 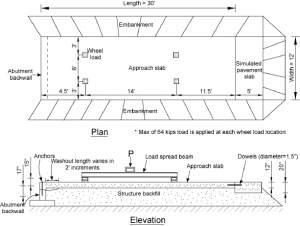 Yung-Tsang Chen and Y. H. Chai (2011), “Experimental Study on the Performance of Approach Slabs under Deteriorating Soil Washout Conditions“, Journal of Bridge Engineering, ASCE, Vol. 16, No. 5, pp. 624-632. 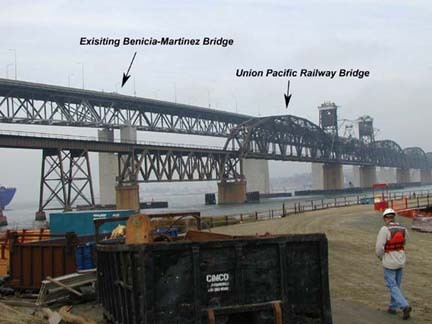 Health Monitoring of the new Benicia-Martinez Bridge – Funded by the California Department of Transportation. Investigators – Y. H. Chai& Carlos Zuritz (UC Davis), Li-Hong Sheng and Ganapathy Murugesh (Caltrans), Hans Strandgaard (CH2M Hill) and Karen Cormier (TY Lin International). This project examines the short and long-term service performance of the long-span box-girder bridges constructed of lightweight aggregate concrete. 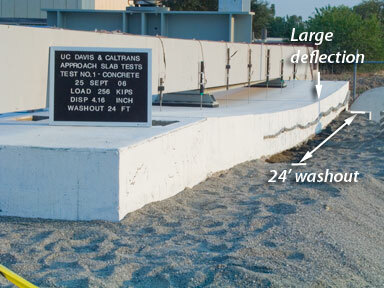 While many bridge structures constructed of lightweight aggregate concrete have performed satisfactory in California, there have been instances where unexpected deformation was observed during the service life of the structure. Most notably, the Parrotts Ferry Bridge near Vallecito in California, which was completed in 1979, experienced a large mid-span deflection after about 12 years of service. 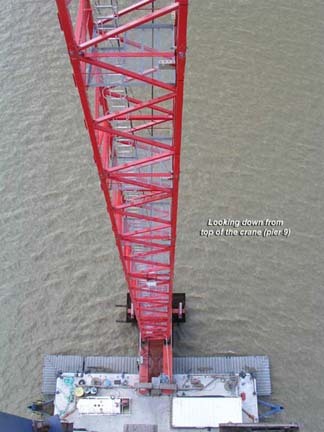 The large mid-span deflection affected the general appearance of the bridge as well as the sight distance of vehicles traveling on the bridge and raised concerns regarding its structural integrity. The unexpected time-dependent deformation of the bridge also hampered the general acceptance of lightweight aggregate concrete as a suitable structural material for long-span bridge construction in California for many years that follow. 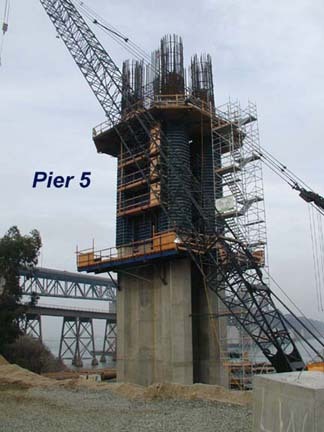 The new Benicia-Martinez Bridge, currently under construction in Northern California, is the first major lightweight aggregate concrete bridge since the completion of the Parrotts Ferry Bridge. The new bridge, which is over 2.5 km (1.6 miles) long, will provide five 3.6 m (12 ft) wide traffic lanes plus two 3 m (9.8 ft) wide shoulders and carry the northbound traffic on Interstate 680 over the Carquinez Strait. 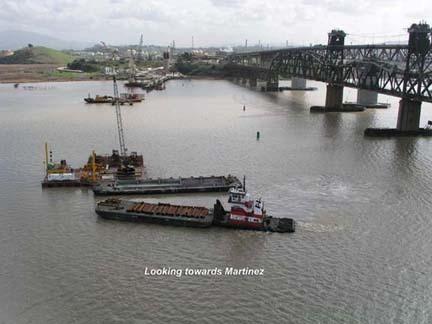 The alignment of the new bridge will be east of the existing Benicia-Martinez Bridge and Union Pacific Railroad Bridge. 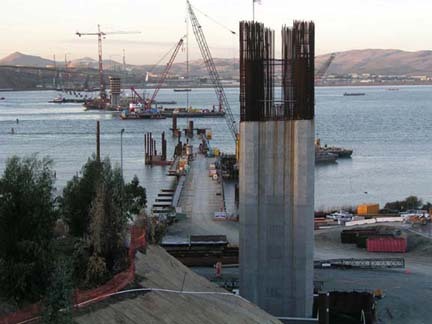 A key feature of the new Benicia-Martinez bridge is the use of sand-lightweight concrete for the superstructure, which will be constructed of a large single-cell box-girder with rib-supported deck overhangs. 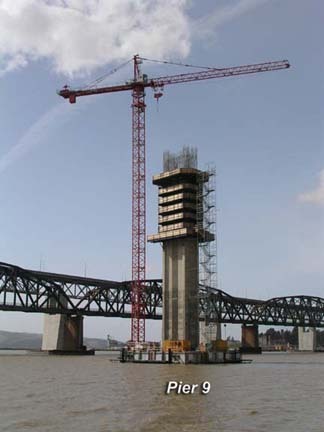 Prompted by the concern over the time-dependent behaviors of the Parrotts Ferry Bridge and the general lack of field data for the behavior of box-girder bridges constructed of high strength lightweight aggregate concrete, a health monitoring plan is put in place to monitor the short and long-term behavior of the new bridge. 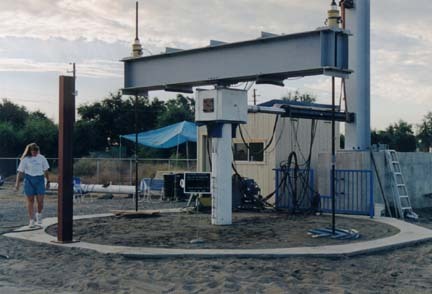 The health monitoring program is a part of a larger instrumentation program which includes the monitoring of the bridge for extreme seismic events. 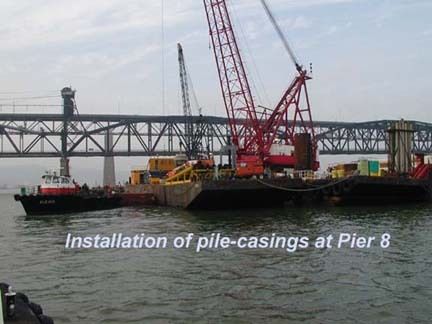 Short and long-term service performance of the new bridge is monitored through time-dependent deformation of the superstructure, corrosion of the pile casings, temperature distribution in the superstructure box-girder, and acoustic sensing for possible fracture of prestressing tendons. 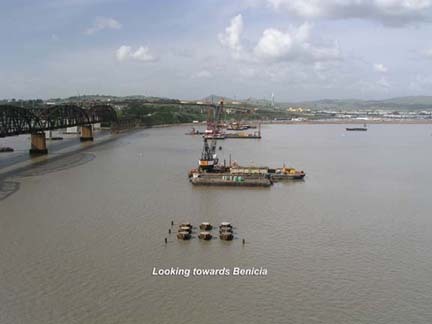 Vertical deflection and shortening of superstructure will be measured in the longest span of the bridge, which is 200.8 m (659 ft) over the shipping channel. Local deformation in the box-girder, as characterized in terms of section curvature and axial strain at the centroid of the section, will be measured using strain gages at four sections of bridge. In addition to correlation with strains and deformations, measured temperature gradient will also be compared with current code recommended temperature gradients, and may serve as the basis for future temperature distribution for design of high strength lightweight aggregate concrete box-girder bridges. Measured deformation of the bridge will also be compared with deformations predicted by current analytical tools and creep and shrinkage models. 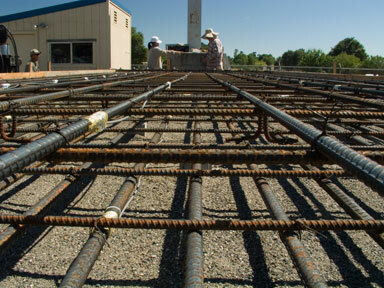 These data, once collected and reduced, will also serve to advance the useful knowledge base for design and analysis of future high strength lightweight concrete structures in California and elsewhere. 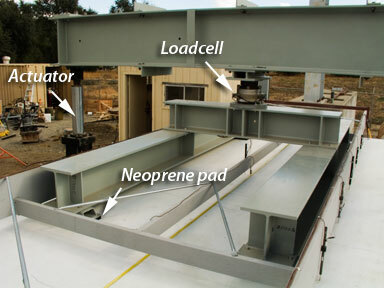 Wheel Load Distributions in Multi-Cell Box Girder Bridges – Funded by the California Department of Transportation. Investigators – Y. H. Chai, Eddy S. S. Song and Sue Hida (Caltrans). For bridges with parameters outside of these constraints, design of such structures requires a more refined 3D analysis, either by finite element or grillage analysis. 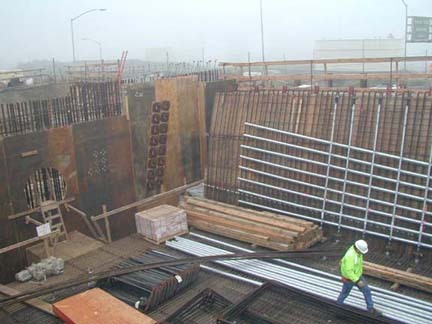 The objective of this project is to conduct a parametric study to examine the limitations imposed by the current AASHTO LRFD Specifications and determine if these limitations can be broadened for typical bridge geometry in California. 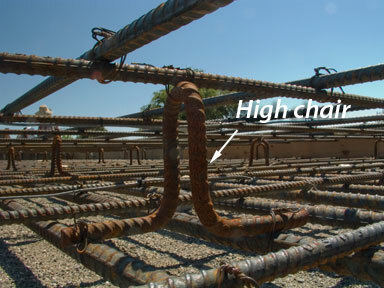 Preliminary results indicated that the current AASHTO LRFD Specifications is conservative with respect to the distribution of bending moments and shear forces to individual girders, and constraints imposed by the Specifications can be extended. 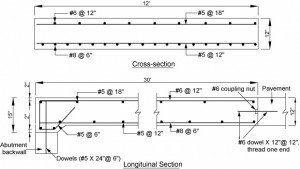 Song, Shin-Tai, Y. H. Chai and Susan E. Hida (2003), “Live Load Distribution Factors for Concrete Box-Girder Bridges”, Journal of Bridge Engineering, ASCE, Vol. 8, No. 5, pp. 273-280. For a PowerPoint presentation of the project, click here. 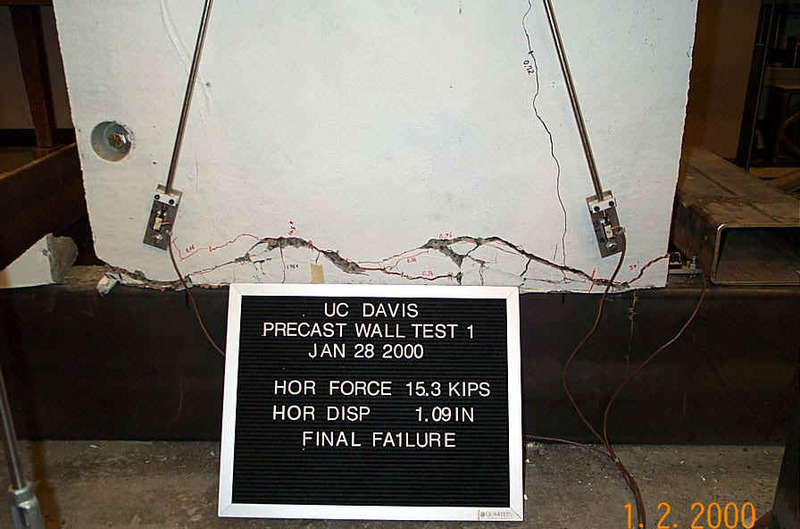 Seismic Behavior of Level and Stepped Cripple Walls – Funded by the California Universities for Research in Earthquake Engineering. Investigators – Y. H. Chai, T. C. Hutchinson and S. K. Vukazich. 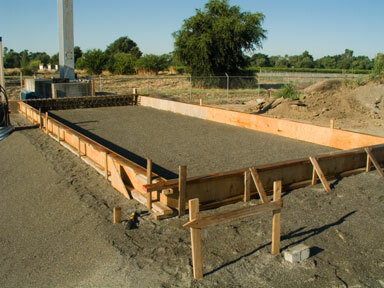 Although modern residential buildings are commonly founded on concrete slab-on-grade, older buildings constructed prior to 1960 were typically built on raised foundations or supported on cripple walls of short wooden studs between the foundation and first floor framing. These old buildings were found to perform rather poorly in recent earthquakes. 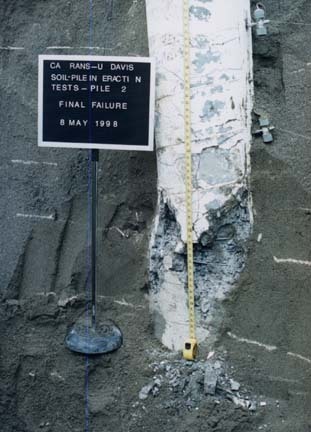 Typical failures involved large lateral displacement of the upper story framing over the soft cripple wall, resulting in a vertical drop of the building causing fracture of sewer, water and gas lines. 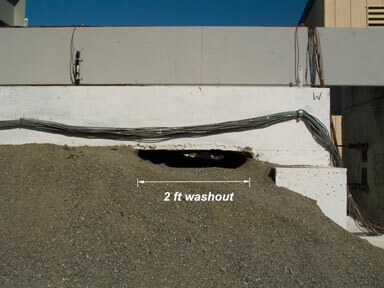 Failures or damage to hillside homes supported on stepped cripple walls were also extensively observed in recent earthquakes. Limited research has been conducted to-date on the seismic response of cripple walls, particularly for stepped cripple walls. 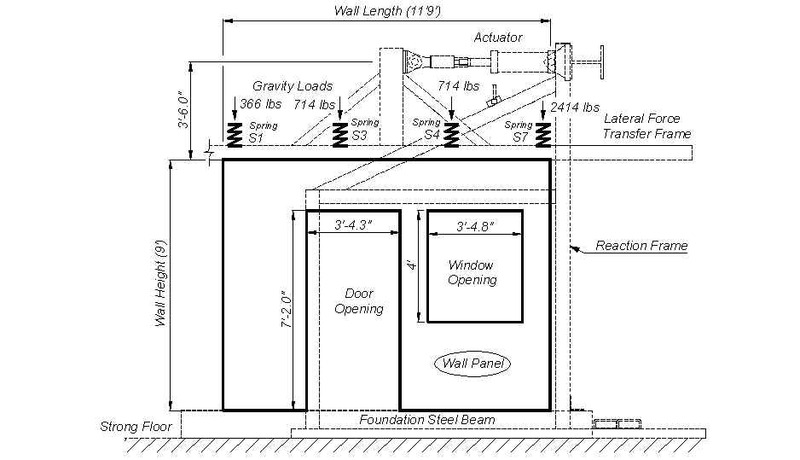 In this project, both level and stepped cripple walls will be tested under a combined axial compression and reversed cyclic lateral displacement. Results from level cripple wall tests are geared towards the retrofit of older homes, whereas results from stepped cripple wall tests are relevant for both retrofit and new construction of hillside homes. 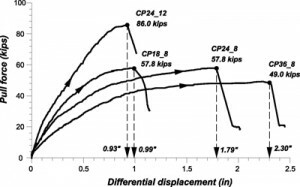 Parameters investigated include wall height-to-width ratios, percentage of bracing for walls, axial load levels, slopes of stepped cripple walls, influence of cement plaster on wall lateral strength, and effects of loading history on the lateral response of cripple walls. A total of 26 cripple walls were tested in this project, with 12 tests on level cripple walls and 14 tests on stepped cripple walls. 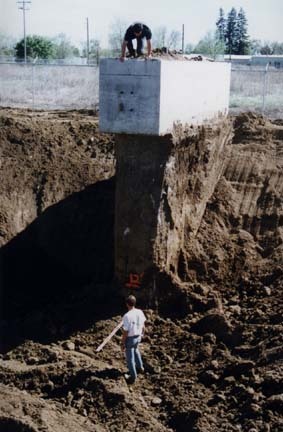 Two heights (2′ and 4′) were investigated for level cripple walls, and two slopes (3 horizontal to 1 vertical, and 2 horizontal to 1 vertical) were investigated for stepped cripple walls. Y. H. Chai and Tara C. Hutchinson (2003), “Seismic Damage Characteristics of Cripple Walls”, Earthquake Spectra, Vol. 19, No. 4, pp. 753-778. 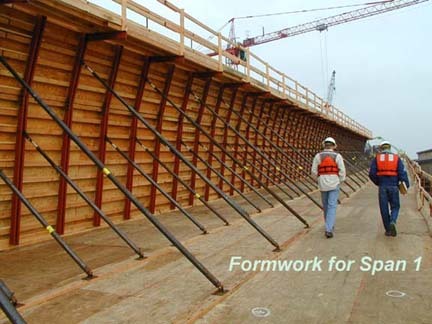 Y. H. Chai, Tara C. Hutchinson and Steven M. Vukazich (2003), “Quasi-Static Reversed Cyclic Response of Level and Stepped Cripple Walls”, Journal of Structural Engineering, ASCE, Vol. 129, No. 5, pp. 567-575. 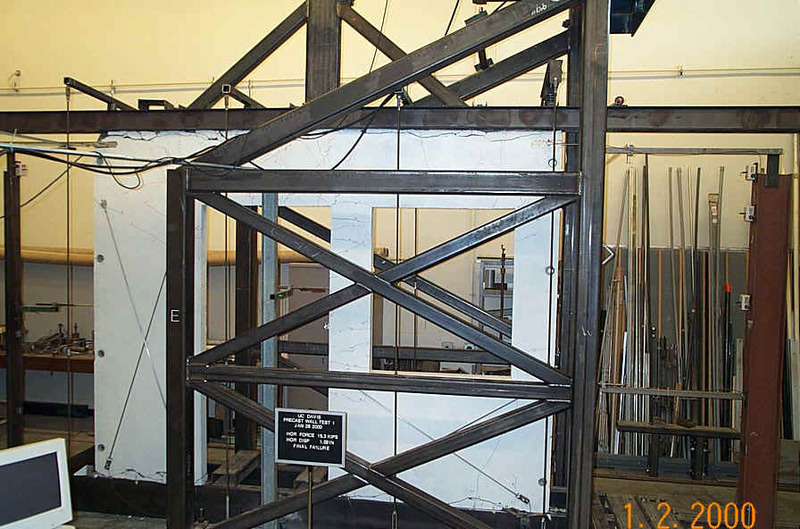 Reversed Cyclic Lateral Response of Lightweight Concrete Precast Wall Panel Tests. Investigators: Y. H. Chai and T. C. Hutchinson. 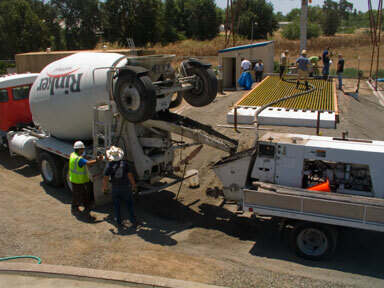 Low-rise concrete buildings of modular design are frequently constructed of precast wall panels, which are relatively stiff due to their in-plane stiffness. These panels are characterized by small panel thickness and low reinforcement ratio. 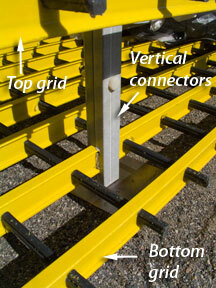 Under seismic conditions, however, concerns often arise with respect to the lateral strength and ductility capacity of the building, connection details for transmitting large forces across different panels or into the foundation, and the damage distribution in the panel at different drift ratios, particularly for panels perforated by large openings. 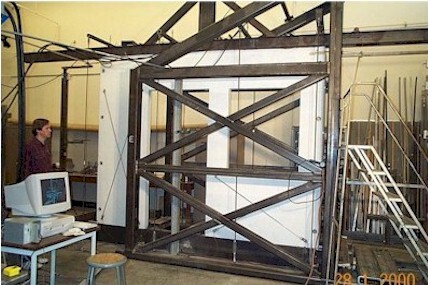 The objective of the lateral load tests is to characterize the in-plane reversed cyclic response of lightweight concrete wall panel with large door and window openings. 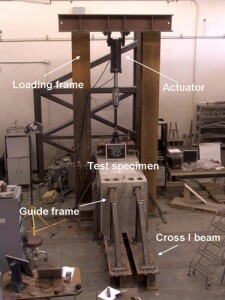 These tests were conducted at full-scale under a simulated gravity compression and quasi-static lateral force or displacement increment of increasing magnitude. Of particular interests are the lateral stiffness, lateral strength, displacement ductility capacity, and damage characteristics of the panel. 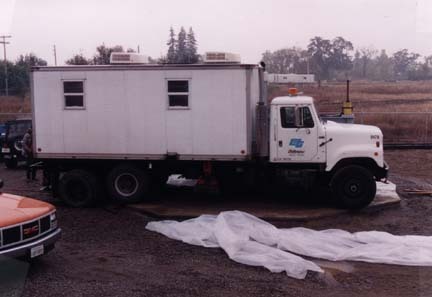 Y. H. Chai and J. D. Anderson (2005), “Seismic Response of Perforated Lightweight Aggregate Concrete Wall Panels for Low-Rise Modular Classrooms”, Engineering Structures, Vol. 27, pp. 593-604. 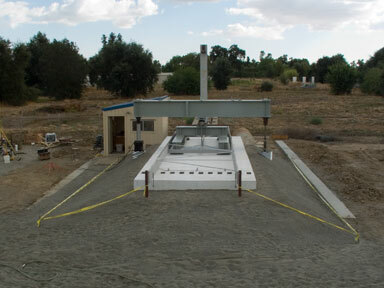 The test panels represented the front entrance of a single story rectangular precast concrete building with test panel length of 3.58 m (11 ft 9 in) for the single-panel, and 7.16 m (23 ft 6in) for the double-panel. 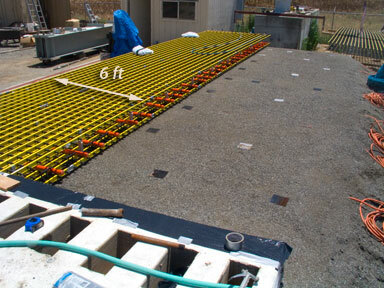 The height of the test panel were 2.74 m (9 ft) for both panels. Standard door and window openings perforated the test panels with perforations representing 36% of the wall area for the single-panel, and 31% of the total wall area for the double-panel. 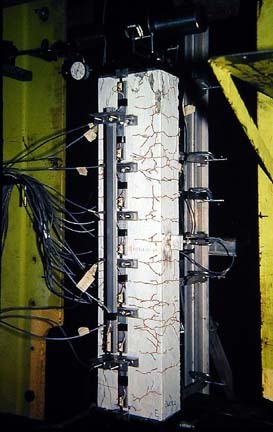 The test panels were constructed with a return wall at each end of the panel to provide out-of-plane stability to the test panel, and to allow an examination of the load transfer between the return wall and main panel as well as the influence of the return wall on the damage characteristics of the main panel. 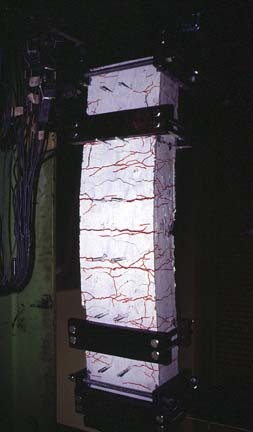 The test panel was nominally 0.1 m (4 in) thick, with 0.05 m (2”) thick Styrofoam block-outs provided on the inside face of the panel and return walls for weight reduction. 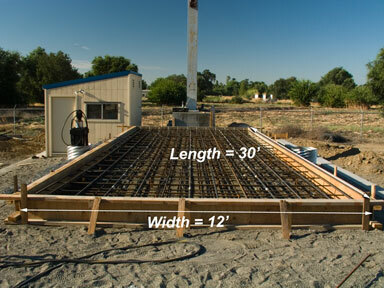 Light-weigth aggregate concrete was used for both panels with a unit weight of 19 kN/m3 (121 lb/ft3), and an average uniaxial compressive strength of 35.7 MPa (5180 psi) at the time of panel testing. The main vertical reinforcement of the panel consisted of 8#4 bars, which were lap-spliced with starter bars of the same diameter with a nominal lap length of 0.61 m (24 in). In addition to the spliced #4 bars, the wall panel was anchored to the foundation beam with a series of 16 mm (5/8 in) diameter high tensile strength inserts. Similar inserts were used to connect the return walls to the main panel, and for connecting the lateral force transfer beam at the top of the wall panel. 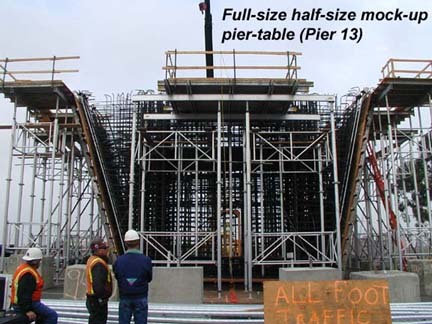 The main panel and return walls were additionally reinforced with a single layer of 6×6-D5/D5 WWF, except in the piers next to the openings where two layers of the welded wire fabric were used. 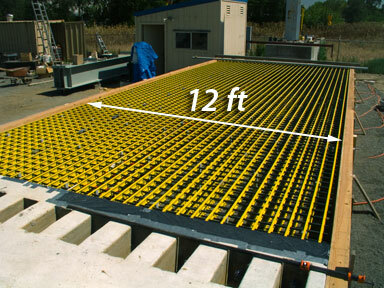 Gravity compression, estimated from the self-weight of the roof system, was applied using tie-downs at discrete points on top of the panel. The lateral force was applied using a double-acting hydraulic actuator at a height corresponding to the center of mass of the roof system. 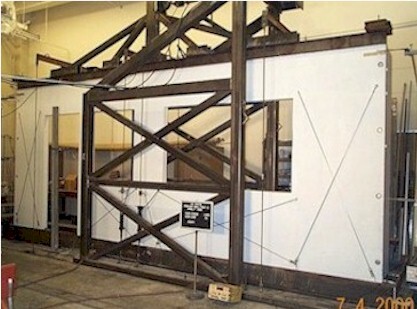 The lateral force from the actuator was transferred to the test panel by a stiff steel frame anchored to the top of the wall panel using high tensile strength inserts. 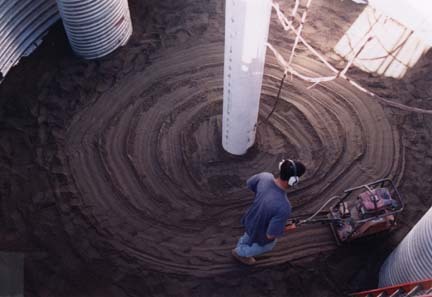 Large-Scale Experimental Testing of Reinforced Concrete Piles in Cohesionless Soil – Funded by the California Department of Transportation. Investigators – Y. H. Chai and T. C. Hutchinson. Abstract: The objective of the project is to characterize the in-ground plastic hinging of reinforced concrete piles under the interaction of a cohesionless soil. 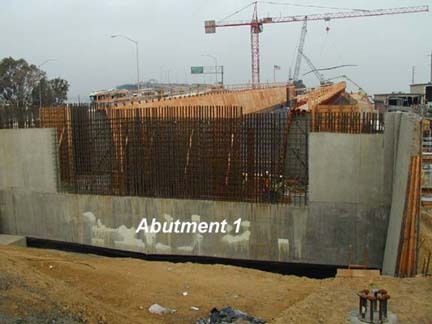 Standard Caltrans 406 mm diameter CIDH reinforced concrete piles were embedded in a large-diameter soil container and subjected to a combined axial compression and quasi-static reversed cyclic lateral loading. The influence of soil density on the ductility capacity, plastic hinge length and depth to plastic hinge were studied. In addition, the kinematic relation between the global ductility demand and local ductility demand was being investigated using the nonlinear moment-curvature response of the concrete pile and nonlinear Winkler soil springs. 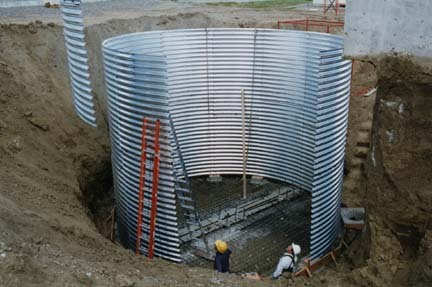 Key Statistics – Soil Container 6.7 m in diameter and 5.5 m depth. 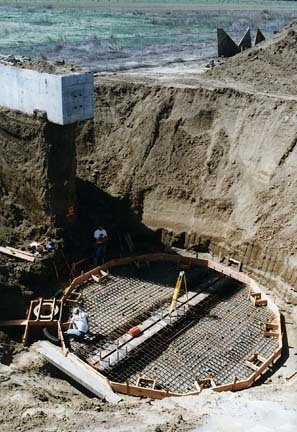 For 406 mm diameter test pile, longitudinal reinforcement content = 2.1% and confining steel ratios = 0.57 and 1.07%. 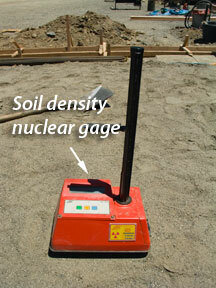 Test soil was a screened river sand with a medium grain size of 0.5 to 0.6 mm diameter. For the dense sand conditions, CPT tip resistance = 14.5 MPa, and for the loose sand condition, tip resistance = 3.5 MPa. Y. H. Chai and Tara C. Hutchinson (2002), “Flexural Strength and Ductility of Extended Pile-Shafts – Experimental Study”, Journal of Structural Engineering, ASCE, Vol. 128, No. 5, pp. 595-602. Y. H. Chai (2002), “Flexural Strength and Ductility of Extended Pile-Shafts – Analytical Model”, Journal of Structural Engineering, ASCE, Vol. 128, No. 5, pp. 586-594. 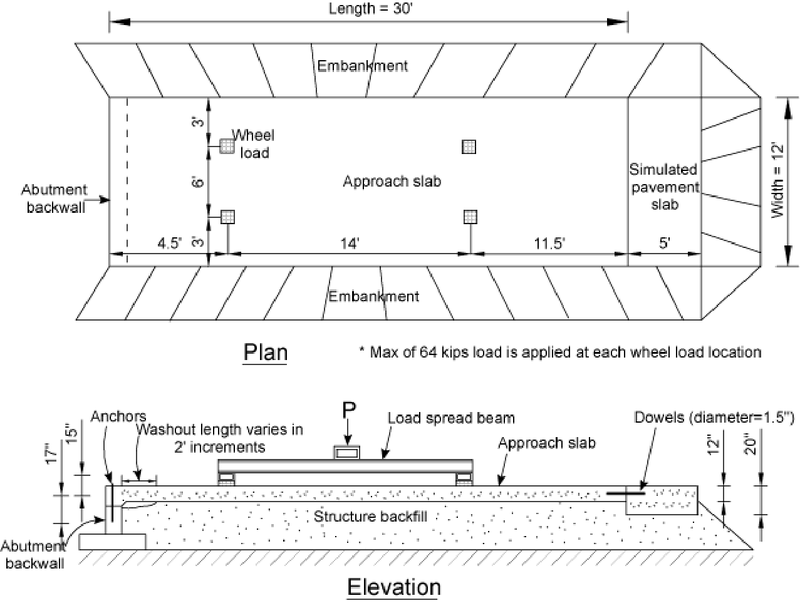 S. T. Song, Y. H. Chai and T. H. Hale (2005), “Analytical Model for Ductility Assessment of Fixed-Head Concrete Piles”, Journal of Structural Engineering, ASCE, Vol. 131, No. 7, pp. 1051-1059. 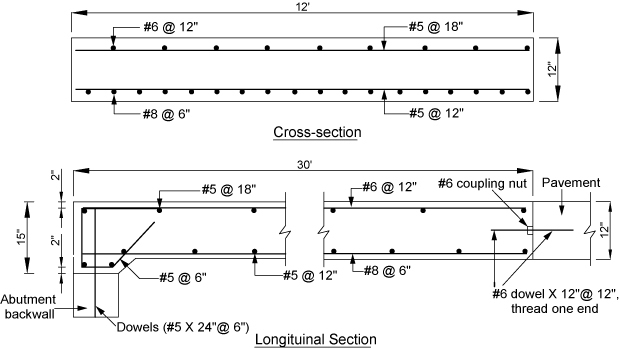 Soil-Pile-Structure Interaction of Bridge Systems Under Long-Duration, Long-Period Ground Motions. 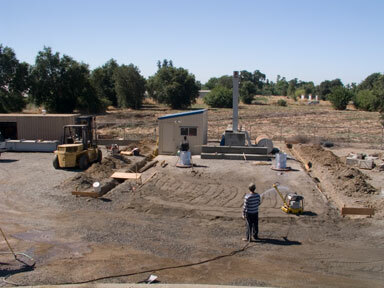 Funded by NSF’s Pacific Earthquake Engineering Research Center. Investigators – R. W. Boulanger, Y. H. Chai, C. J. Curras, T. C. Hutchinson and I. M. Idriss. Abstract: Tall bridge structures supported on soft soils are particularly vulnerable to near-fault ground motions due to the long-period characteristic of these structures. The large velocity pulses in the near-fault ground motion tend to subject the structure to a very large displacement ductility demand which, in the case of full-ductility structure, would occur in the columns or pier-walls of the structure. Unacceptably large residual deformations may also occur in the structure after an earthquake. 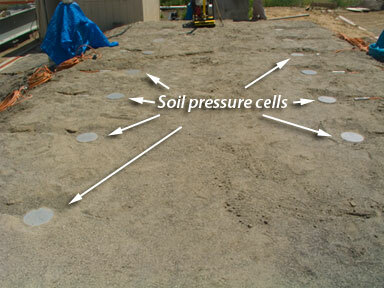 The extent of the these deformations depends on the amplitude, period and shape of the large pulses in the ground motion, and the lateral strength and period of the structure which are inherently coupled with the condition of the supporting soil, particularly for soft soils. 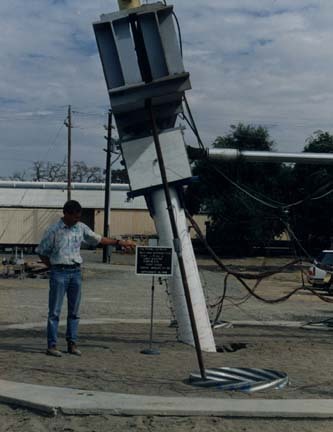 For very large magnitude earthquakes, the duration of the intense ground motion can be significantly lengthened due to a large fault rupture, and the long-duration ground motion is important for the dynamic stability of tall bridge structures. 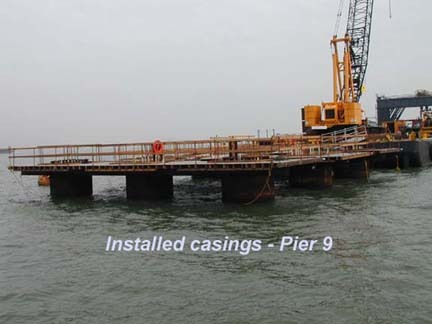 As current design of tall bridge structures often result in relatively low lateral strength for these structures, the combination of low strength and large lateral displacement leads to a situation where P-D effect becomes very important. As P-D effects reduce the effective lateral strength of the structure, the structure response tends to be characterized by progressive yielding in one direction. The asymmetric accumulation of inelastic deformations in one direction becomes increasingly important as the duration of the ground motion is increased. Since the hysteretic characteristics of yielding elements have a pronounced influence on the ductility demand and residual deformation, the response of tall bridge structures can be expected to be significantly affected by the nonlinear interaction of the supporting soil with the structure. This project will investigate the influence of long-period and long-duration ground motions on tall bridge structures. The software FEAP coupled with FEDEAS (Finite Elements for Design, Evaluation and Analysis of Structures) is being used for the analysis. T. C. Hutchinson, Y. H. Chai, R. W. Boulanger and I. M. Idriss (2004). “Estimating Inelastic Displacements for Design: Extended Pile-Shaft-Supported Bridge Structures”, Earthquake Spectra, Vol. 20, No. 4, pp. 1081-1094. T. C. Hutchinson, Y. H. Chai, R. W. Boulanger and I. M. Idriss (2004). “Inelastic Seismic Response of Extended Pile-Shaft-Supported Bridge Structures”, Earthquake Spectra, Vol. 20, No. 4, pp. 1054-1080. 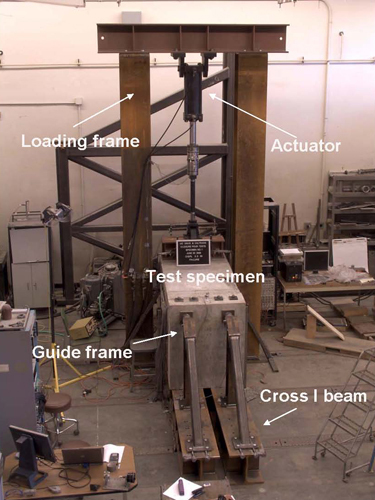 Cumulative Damage Assessment of Structures under Intense Seismic Loading – Funded by the National Science Foundation’s Research Initiation Grant. Investigators – Y. H. Chai and K. M. Romstad. Abstract: Although the potential for cumulative damage of structures during long duration earthquakes is generally recognized, most design codes do not explicitly take into the damage potential of such events. 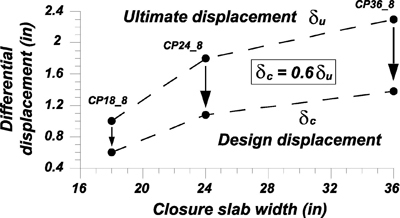 The traditional use of displacement ductility factor as an implicit damage parameter in design codes is inadequate, since it is implicitly assume that structural damage occurs only due to the maximum deformation and is independent of the number of non-peak inelastic cycles or plastic strain energy dissipation. This project addressed the issues in the cumulative damage assessment of structures using energy-based linear damage model and the classical low-cycle fatigue damage model. A methodology for the formulation of duration-dependent inelastic design spectra is proposed. Y. H. Chai, K. M. Romstad, and S. M. Bird (1995), “Energy-Based Linear Damage Model for High-Intensity Seismic Loading”, Journal of Structural Engineering, ASCE, Vol. 121, No. 5, pp. 857-864. Y. H. Chai and K. M. Romstad (1997), “Correlation Between Strain-Based Low-Cycle Fatigue and Energy-Based linear Damage Models”, Earthquake Spectra, Vol. 13, No. 2, pp. 191-209. Y. H. Chai, P. Fajfar and K. M. Romstad (1998), “Formulation of Duration-Dependent Inelastic Seismic Design Spectrum”, Journal of Structural Engineering, ASCE, Vol. 124, No. 8, pp. 913-921. Y. H. Chai and P. Fajfar (2000), “A Procedure for Estimating Input Energy Spectra for Seismic Design”, Journal of Earthquake Engineering,Vol. 4, No. 4, pp.539-561. S. K. Kunnath and Y. H. Chai (2004), “Cumulative Damage-Based Inelastic Cyclic Demand Spectrum”, Earthquake Engineering and Structural Dynamics, Vol. 33, pp. 499-520. Y. H. Chai (2005), “Incorporating Low-Cycle Fatigue Model into Duration-Dependent Inelastic Design Spectra“, Earthquake Engineering and Structural Dynamics, Vol. 34, pp. 83-96. 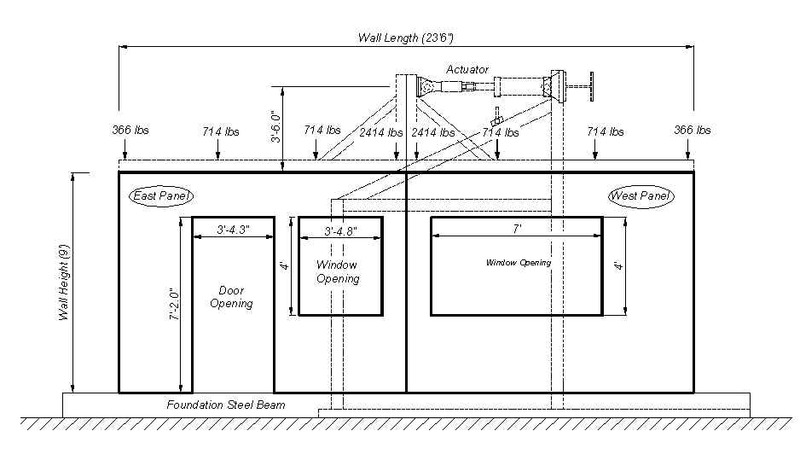 Lateral Stability of Structural Walls under Seismic Loading – Partially Funded by the National Science Foundation’s Research Initiation Grant. Investigators – Y. H. Chai and D. T. Elayer. Abstract: Depending the level of ductility imposed on a reinforced concrete wall, tensile strains as high as 3% may be developed in the end-regions of the wall. The large tensile strain is a cause for concern since the lateral stability of the wall depends on the magnitude of the tensile strain. 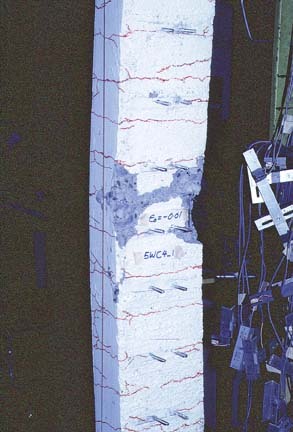 Wide cracks developed by a large yield excursion must be closed before the in-plane lateral strength of the wall can be fully developed in the reversed direction. A critical condition exists prior to closing of the cracks where an excessive out-of-plane displacement may occur causing the wall to become unstable. In this project, reinforced concrete columns with details representative of the end region of the wall were tested under reversed cyclic axial tension and compression. 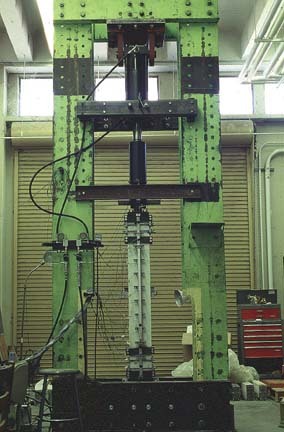 Based on the test results, a kinematic model was developed for estimating the maximum tensile strain that may be imposed on a ductile reinforced concrete wall. The model was shown to provide a conservative estimate of the maximum tensile strain that may be imposed on the wall, and the model may be further developed into a criterion for specifying the minimum wall thickness of ductile planar walls. 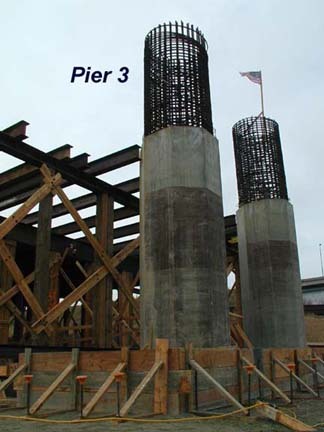 Y. H. Chai and T. D. Elayer (1999), “Lateral Stability of Reinforced Concrete Columns under Axial Reversed Cyclic Tension and Compression”, ACI Structural Journal, Vol. 96, No. 5, pp. 780-789. Y. H. Chai and S. K. Kunnath (2005), “Minimum Thickness for Ductile RC Structural Walls”, Engineering Structures, Vol. 27, pp. 1052-1063. 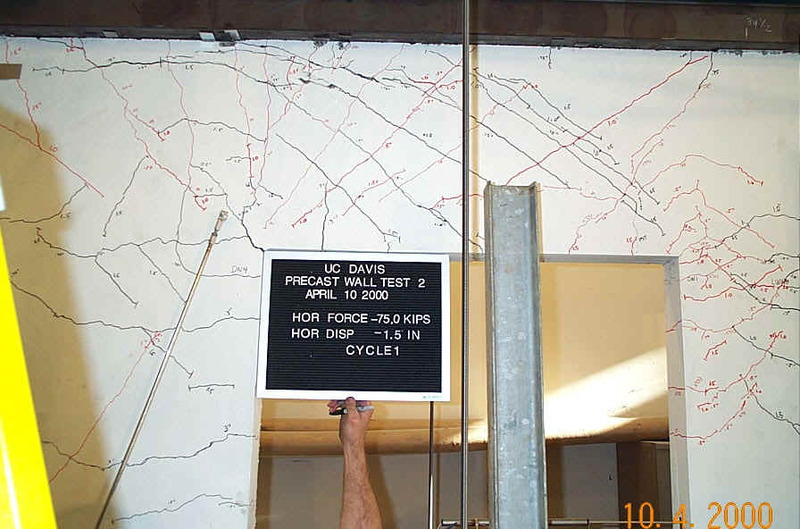 Seismic Response of Slitted Reinforced Concrete Masonry Wall – Partially Funded by the National Science Foundation’s Research Initiation Grant and Concrete Masonry Association of California and Nevada – Investigators Y. H. Chai and L. L. Yaw. Abstract: Although a ductile failure mode can be developed in squat reinforced concrete masonry walls by adopting the capacity design principle, the ensuing ductility capacity of these members can be rather limited due to the presence of relatively high shear stresses. 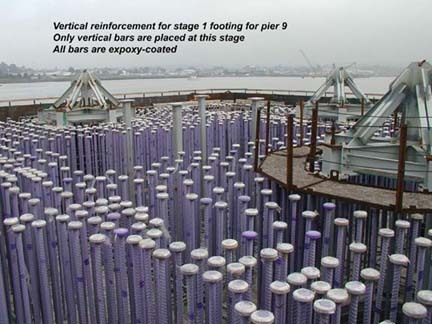 This project investigated the possibility of enhancing the ductility capacity of reinforced concrete wall-piers by incorporating vertical separation joints into the center region of the piers. The conventional construction of masonry walls using running-bond is replaced by stack-bonding of the blocks with the horizontal reinforcement discontinued across the vertical separation joint. 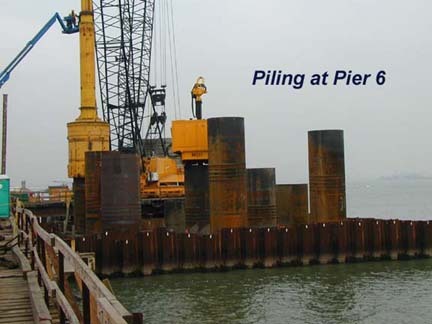 Although testings of monolithic and slitted masonry wall-piers showed that the inclusion of vertical separation joints caused a 25% reduction in lateral stiffness and 38% reduction in lateral strength, the ultimate drift capacity of the slitted wall-pier was increased by 27%. Y. H. Chai and L. L. Yaw (1999), “Reversed Cyclic Response of Monolithic and Slitted Reinforced Concrete Masonry Wall-Piers”,Engineering Structures, Vol. 21, No. 2, pp. 99-111.